This is the third in a series of posts analyzing randomly selected provisions in HR3200, the House Democratic health care restructuring bill. The hope is that through random selection of pages from the House Bill, using the dartboard method, some light will be shed on the otherwise dense House Bill. 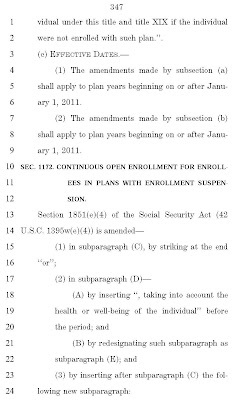 The page selected for today’s post is page 347 of the House Bill, which contains the final paragraphs of Sec. 1171, “Limitation on Cost-Sharing for Individual Health Services.” This section seems positive on its face – who could be against limits on cost-sharing – but these limitations raise the question whether this will have a negative effect on the availability to alternatives to traditional Medicare. This provision places limits on cost-sharing (for example, co-pays) under Medicare+Choice programs so that the cost-sharing is no more than under the original medicare fee-for-service program. What effect will this have on the availability of these alternatives? (i) In general.—For purposes of this part, the term “benefits under the original medicare fee-for-service program option” means those items and services (other than hospice care) for which benefits are available under parts A and B to individuals entitled to benefits under part A and enrolled under part B, with cost-sharing for those services as required under parts A and B or an actuarially equivalent level cost-sharing as determined in this part. ‘‘(ii) PERMITTING USE OF FLAT COPAYMENT OR PER DIEM RATE.—Nothing in clause (i) shall be construed as prohibiting a Medicare Advantage plan from using a flat copayment or per diem rate, in lieu of the cost-sharing that would be imposed under part A or B, so long as the amount of the cost-sharing imposed does not exceed the amount of the cost-sharing that would be imposed under the respective part if the individual were not enrolled in a plan under this part.’’. Are you having fun reading this? I’m not. This is a tough slog through mind-numbing verbiage which accomplishes limits on cost-sharing, but does not reveal the implications of such cost sharing limitations for people who prefer alternatives to traditional Medicare. Might this have the effect of eliminating the alternatives to traditional Medicare because of the limitations on cost-sharing? Am I paranoid, or correct, or both? As with every single provision I have read during this series, I have to take multiple breaks before my head explodes with frustration. And this section is only two pages long! Two pages out of 1018 pages. VERDICT: Now I understand that the devil is not just in the details, it is the details. This random selection method has forced me to try to understand provisions which are so imposing that the eye naturally averts to something easier to understand. Given a choice, I never would read these sections. And this is just day three. The unintended consequence of this series - now no member of Congress will read the bill. The prospect of an exploding head is too daunting. and is another good reason that the proposal should be scrapped. Is the Left-Wing Hoping for Violence? Little Nice To Say About The U.S.
Obama Doesn't Really Have A "Plan"